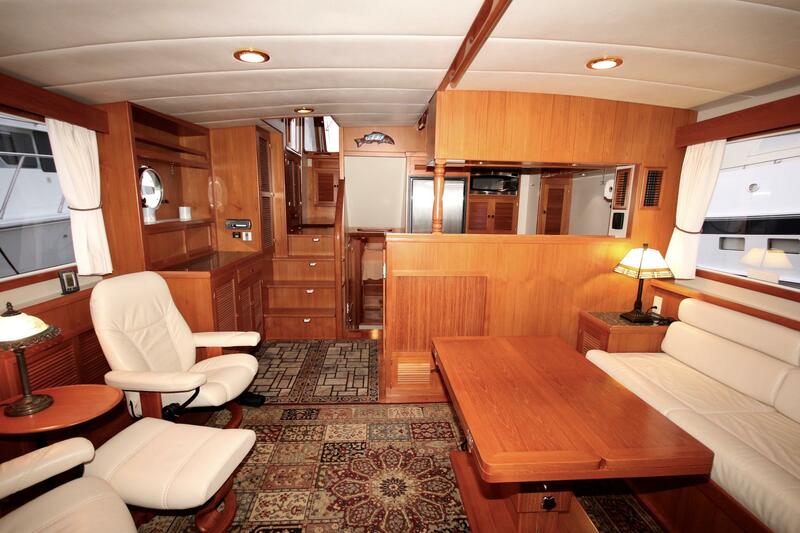 A sparkling example of a meticulously-maintained Kadey-Krogen 44. 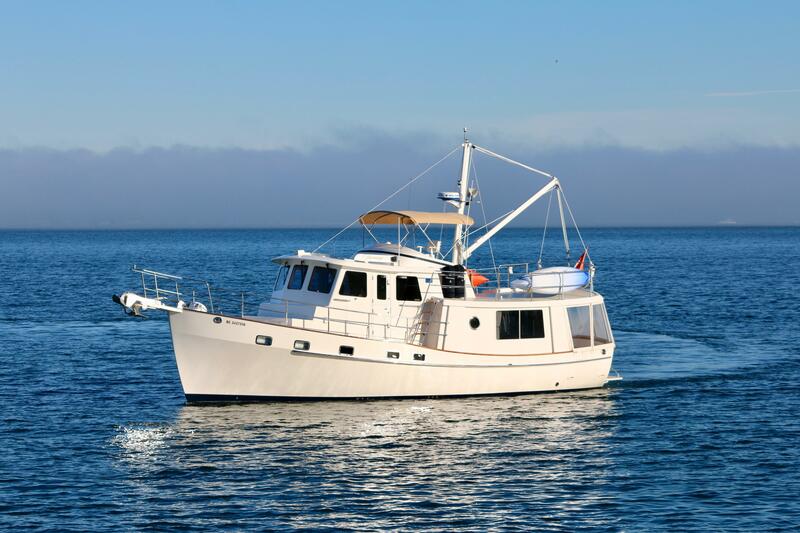 This full displacement offshore pilothouse trawler has enjoyed the lavish attention of her current owners for the past 7 years. She has been cruised lightly and maintained heavily. She features both air conditioning and hydronic diesel heat; electronic engine controls and full function remote control module; Bow and Stern Thrusters; and ABT Trac Stabilizers. She boasts continual upgrades including New TZ Touch 2 Navigation system with NXT doppler radar, AIS transceiver and more! 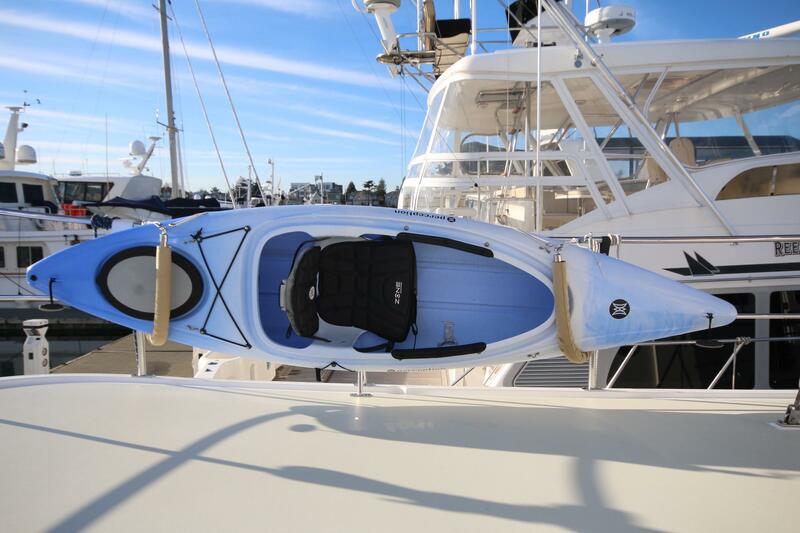 The Kadey-Krogen 44 evolved in 2004 from the venerable Kadey-Krogen 42 of which over 200 were built. Between 2004 and 2011, 26 examples of the KK 44 were built. Harmony is number 22 of the series. 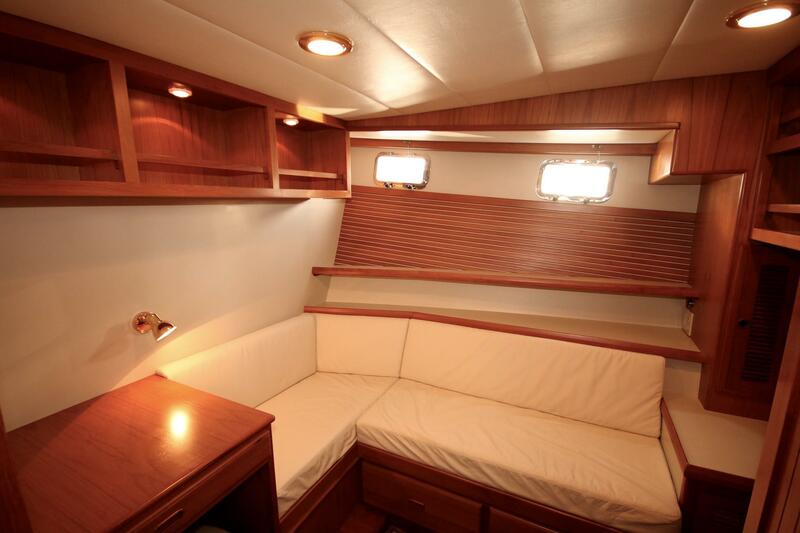 The KK 44 perfected the original concept of a great sea boat, a transoceanic voyager and a comfortable liveaboard. 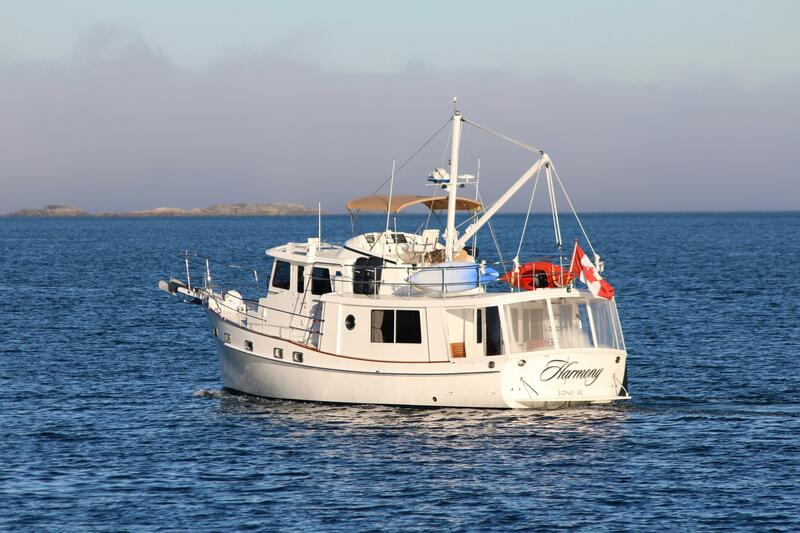 Harmony was originally launched in 2009 as a well-equipped stock boat by Kadey-Krogen in Seattle. 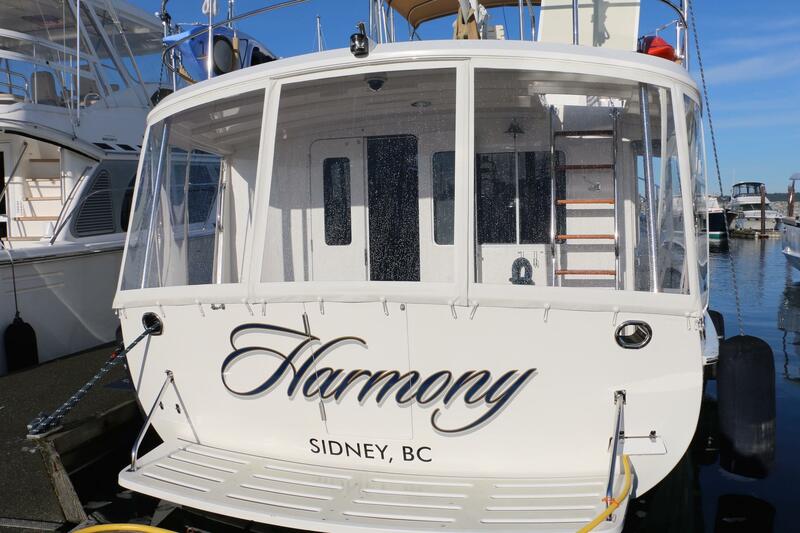 After a few years with her original owners, Harmony was purchased by her current owners and imported to Canada where she has been constantly upgraded and maintained with an "open checkbook" philosophy. 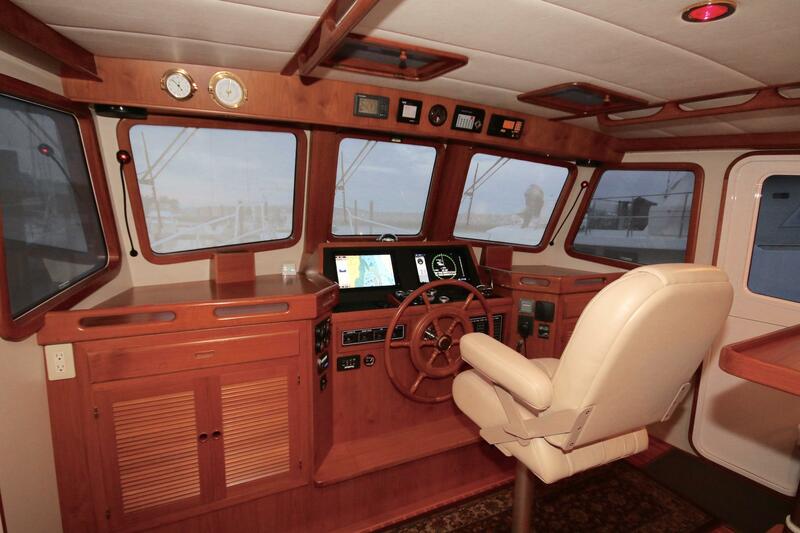 A finer example of this well-equipped, full displacement pilothouse cruiser will be very hard to find. 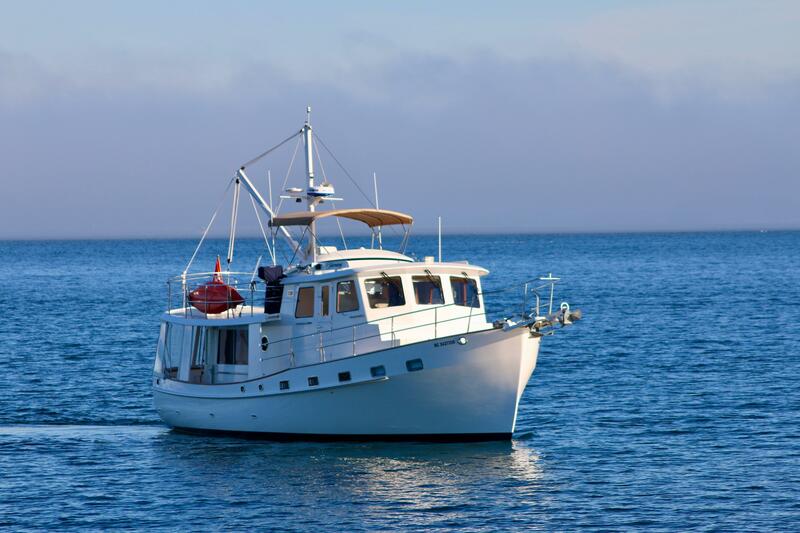 Where else in a vessel of 49' LOA will you find the elements of range, seaworthiness, superb ergonomic layout, quality of build and lavish liveaboard comfort that are found in the Kadey Krogen 44? 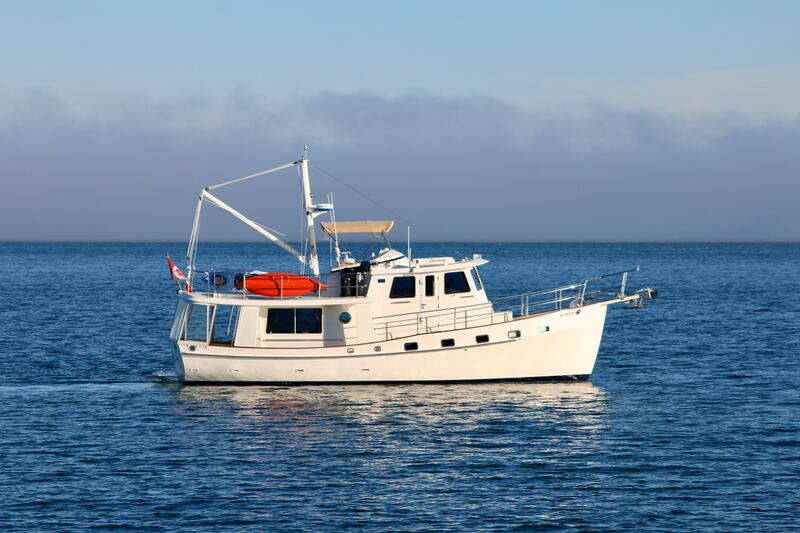 Where else will you find a Kadey Krogen 44 with the equipment list and maintenance record of Harmony? 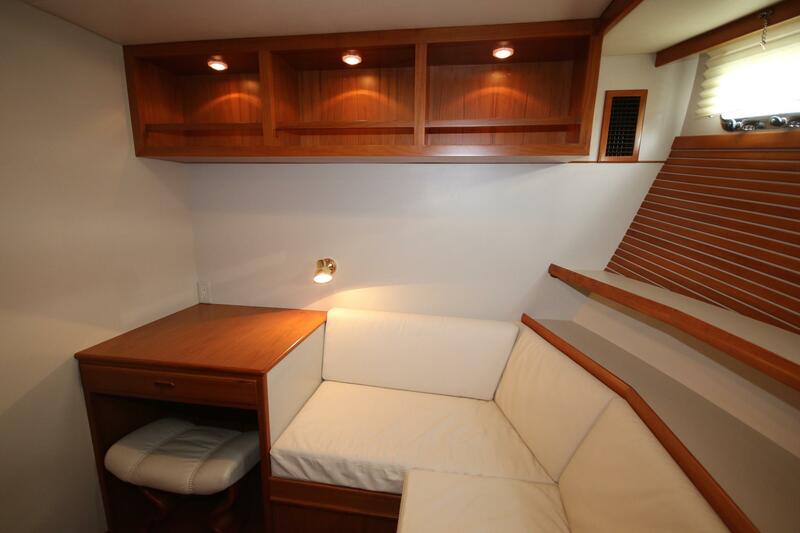 Harmony features the sought-after wide body layout which provides a dramatically more spacious salon while offering a safe, covered walkway along the starboard side from the huge, fully-enclosed cockpit to the expansive foredeck. 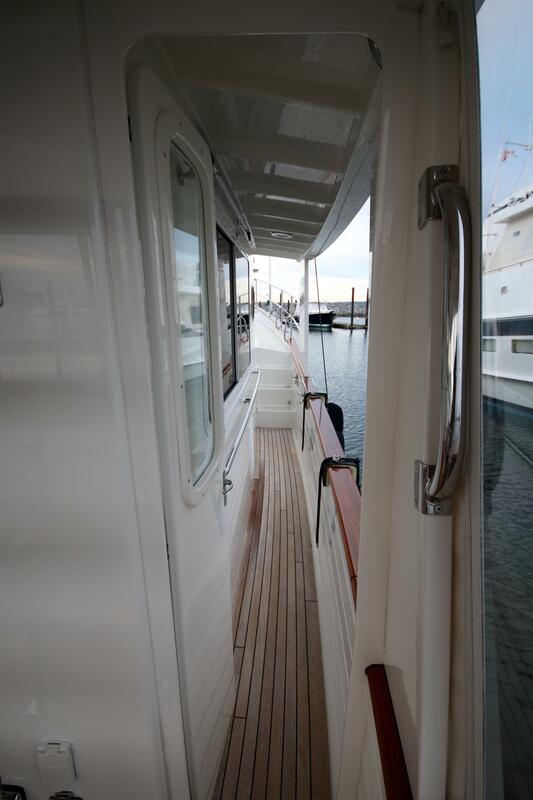 Continuing around the pilothouse to the port side, one ascends the four steps to the massive boat deck area and raised flybridge. 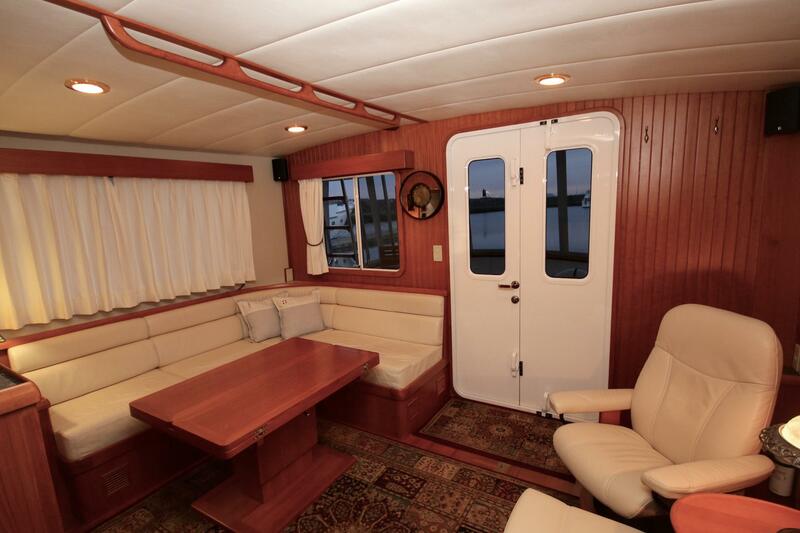 Inside the boat, the spacious living areas are joined by ergonomically-designed, easy to negotiate companionways of just four steps with well-placed handrails. 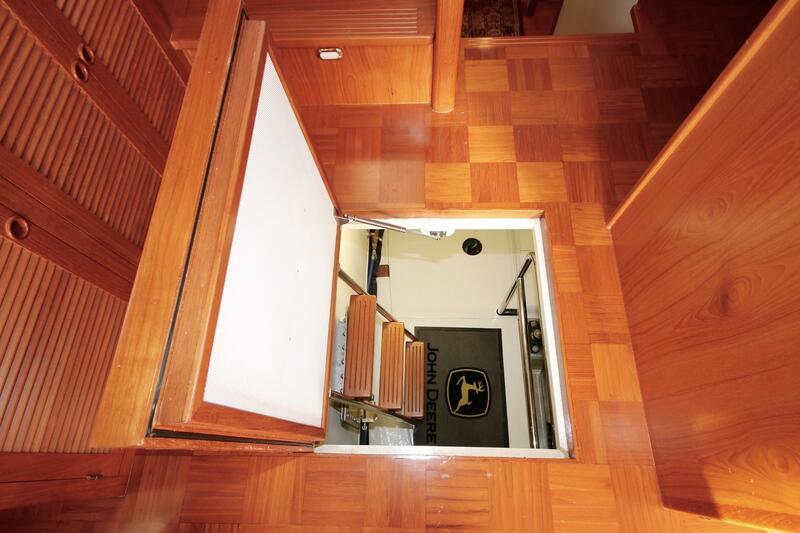 This classic "split-level" layout eliminates long, curving staircases that present such a challenge in a seaway on some boats. The Salon offers space for up to 6 people to dine while providing adequate space for two full-size recliners and ottomans. 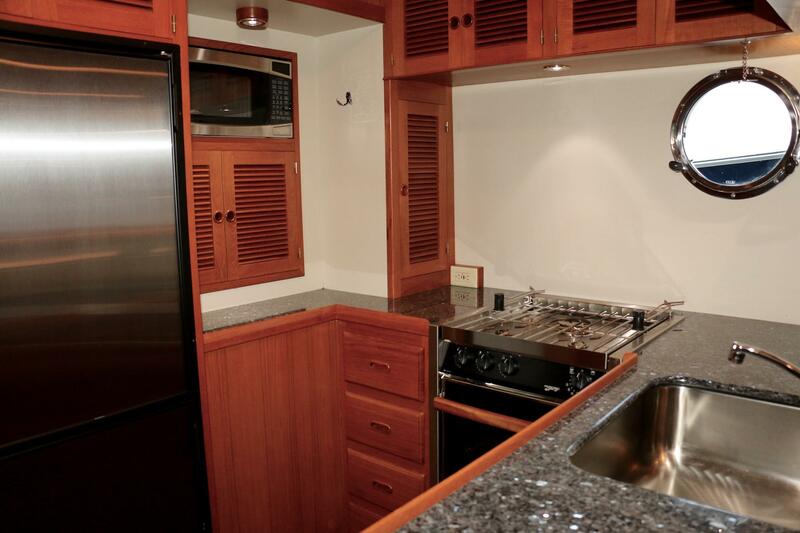 The Galley features amenities, space and storage normally found on much larger vessels. 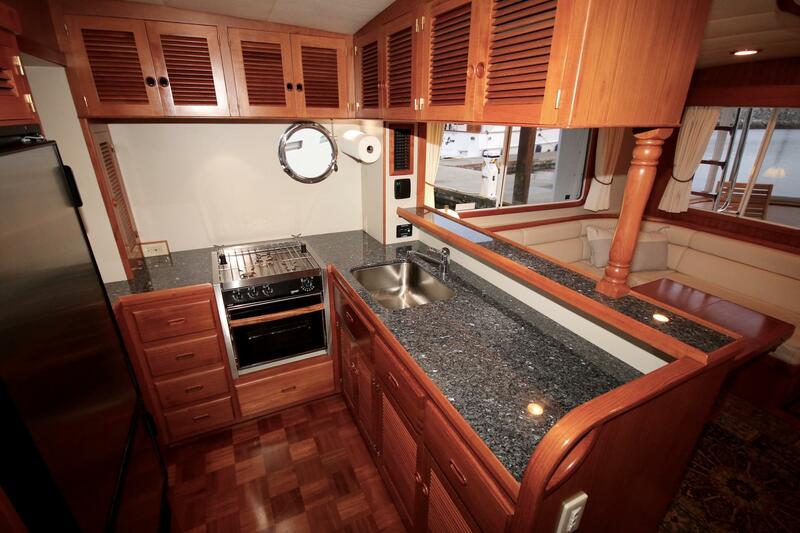 A large stainless steel sink and extensive granite countertops provide tremendous working space. Stainless steel fridge and Force 10 propane stove / oven are complimented by a microwave and an icemaker. 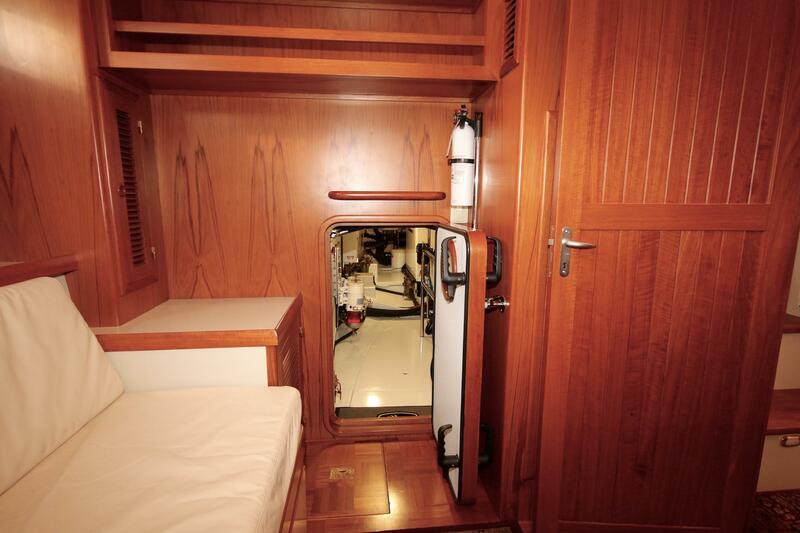 The Accommodations level features a very spacious master cabin forward with queen berth, large hanging lockers and an abundance of live-aboard storage. 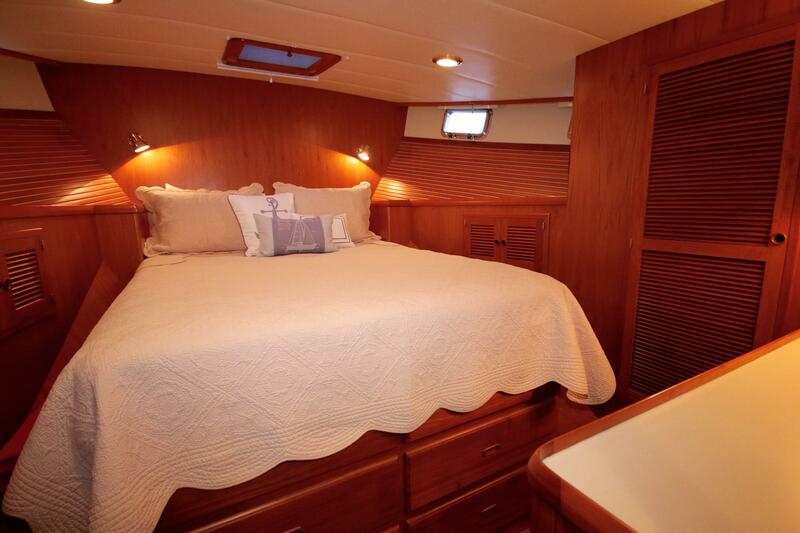 A guest room to starboard converts from an office area with settee to a comfortable double bed for overnight guests. 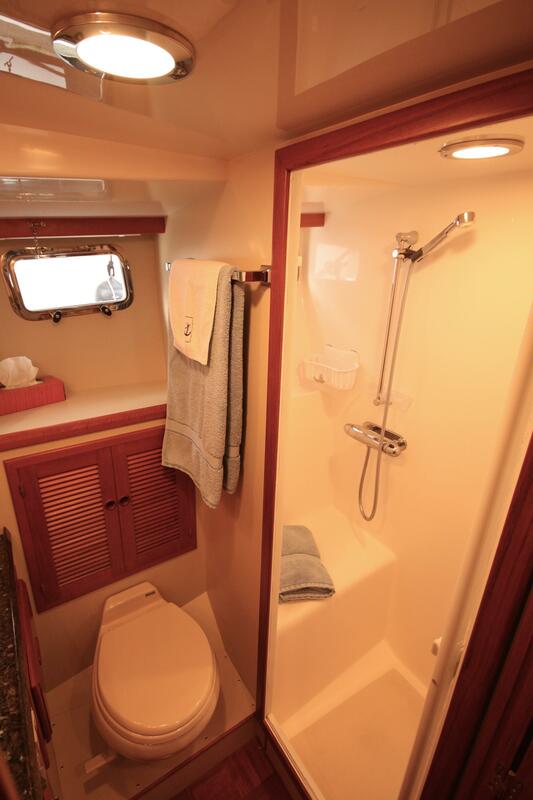 The well-proportioned head features an extra large separate shower stall with seat. 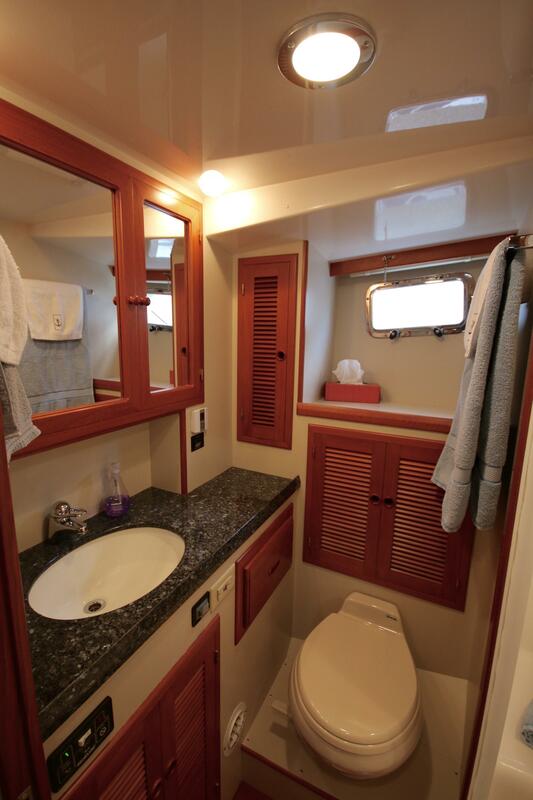 The laundry pair is also located on this level, in the companionway near the master stateroom. 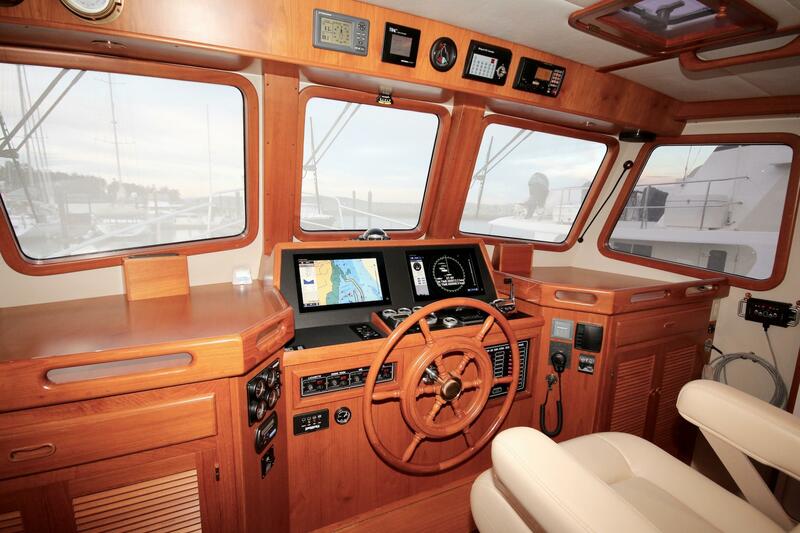 The Pilothouse is the physical and spiritual nucleus of the boat. 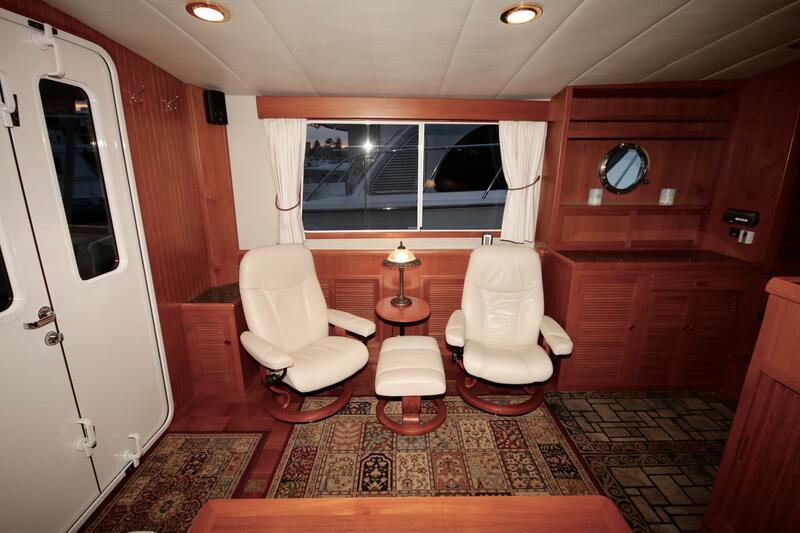 Trimmed generously in teak with leather seating, it is a place of warmth, security and comfort. A centre-mounted leather helm chair faces the expansive display of new electronics and controls. 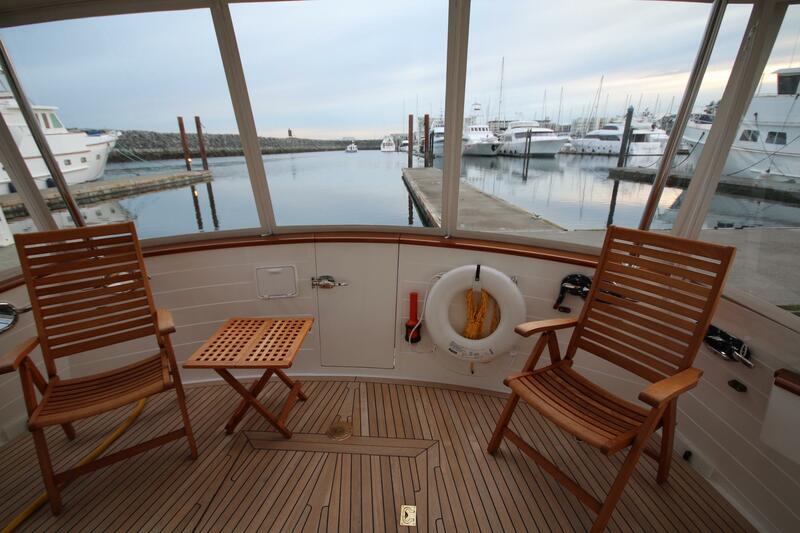 A raised bench seat behind the helm provides a superb vantage point for 4 passengers. 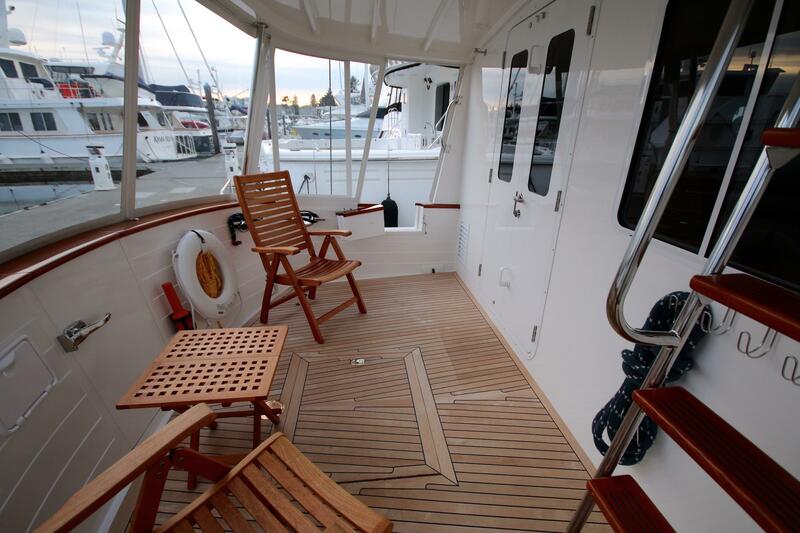 This seat converts to a double pilot berth when required. 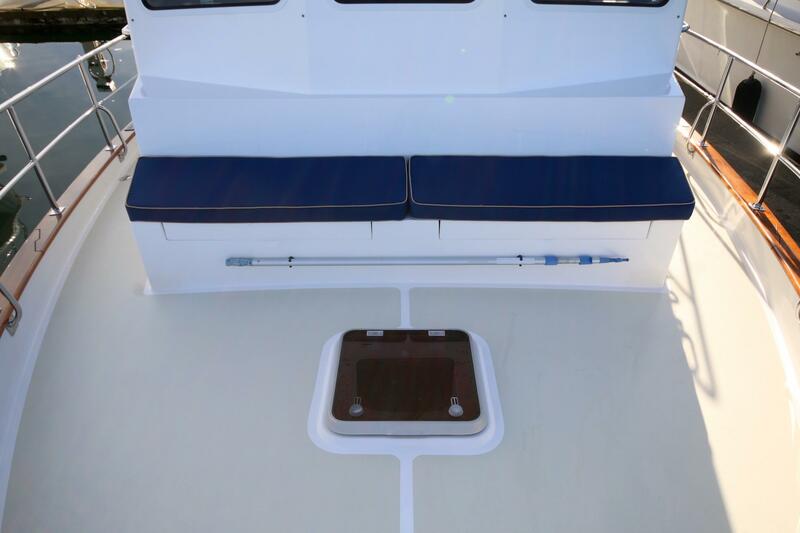 The near 360 degree visibility renders the well-appointed flybridge virtually redundant as a command centre. Mechanically, Harmony is designed for long-range self-sufficiency. 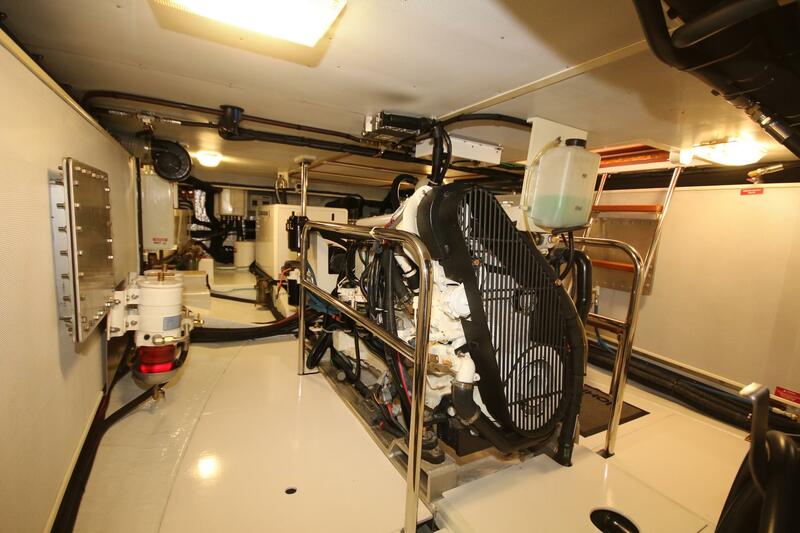 Her M1 rated (continuous duty) John Deere engine is designed to run 24 hours a day at wide open throttle, though purrs along quietly and efficiently at 8 knots and has the "legs" to cross oceans at 7 knots. 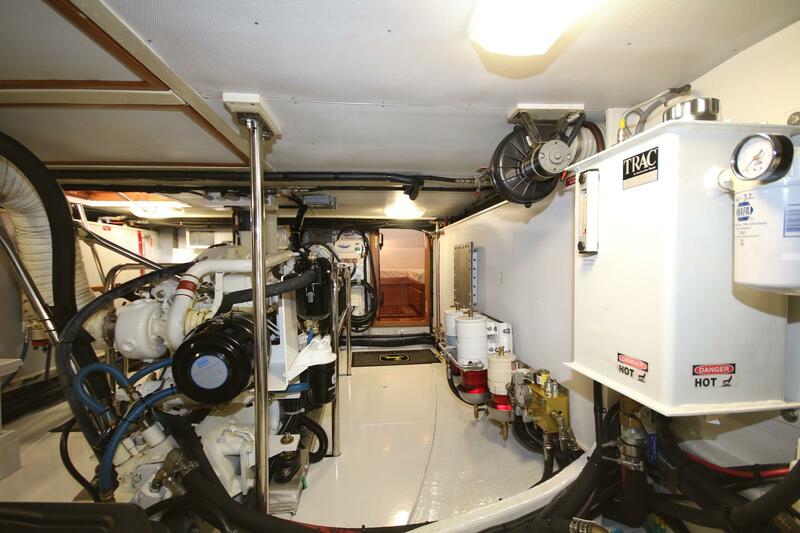 Her immaculate engine room houses all the on-board systems in layout which provides ease of access for on-going maintenance. 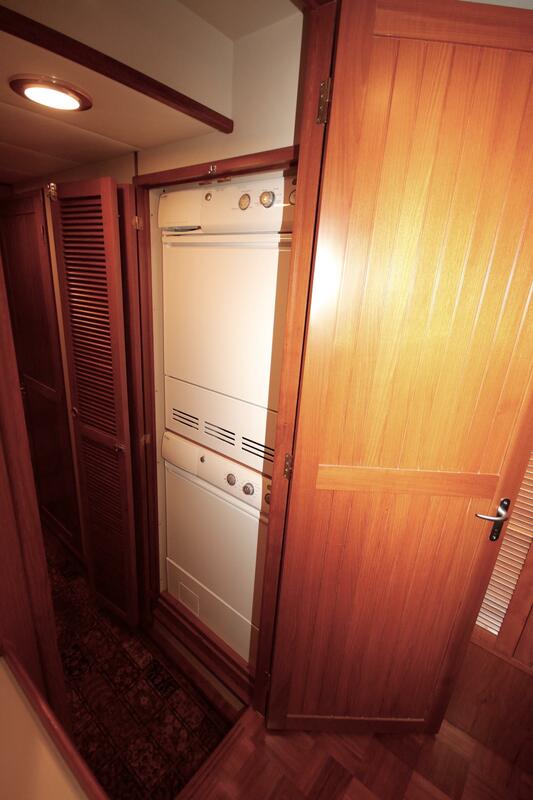 No expense has been spared in ensuring year round cruising comfort on Harmony. 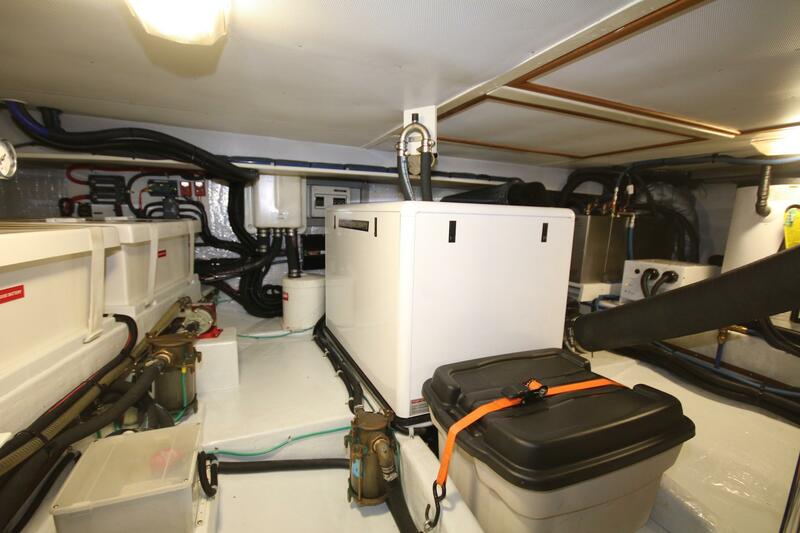 She was built originally with reverse cycle heat / air conditioning (3 systems) which provides tremendous air flow and the ability to heat the boat very quickly when attached to shore power or running the generator. 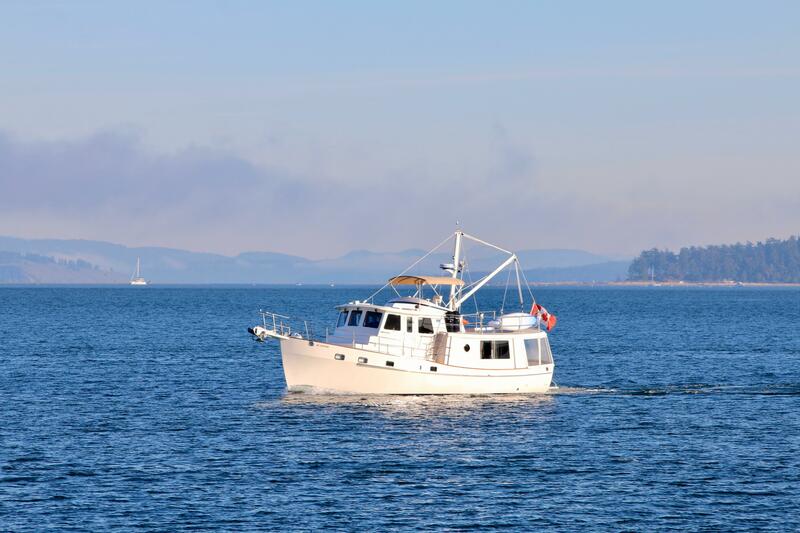 A Hurricane Hydronic furnace was installed in 2012 with convectors and thermostats in each cabin, proper defrosters in the pilothouse and a circuit to heat the hot water tank, ensuring a comfortable environment while cruising without running the generator. 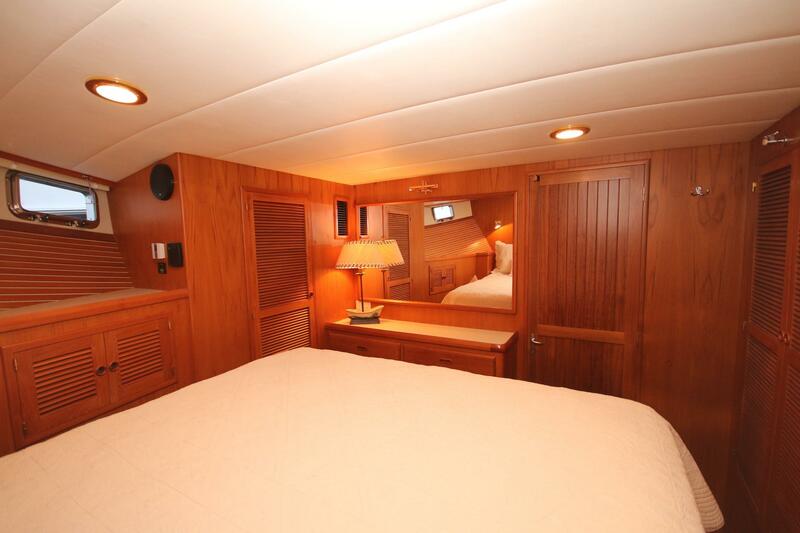 Providing additional comfort for winter cruising, Harmony's full cockpit enclosure provides a massive sunporch which is fully sheltered from wind and rain. 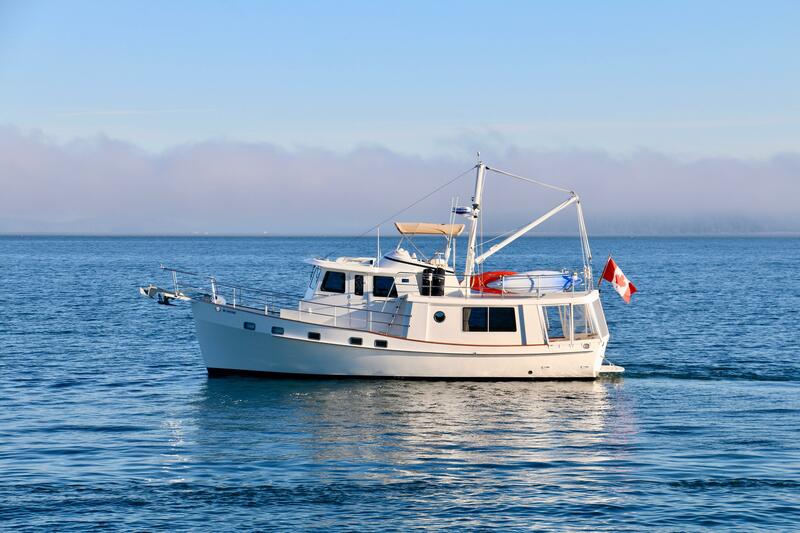 While Harmony can accommodate and entertain a crowd, she is the perfect couple's boat with occasional guests. 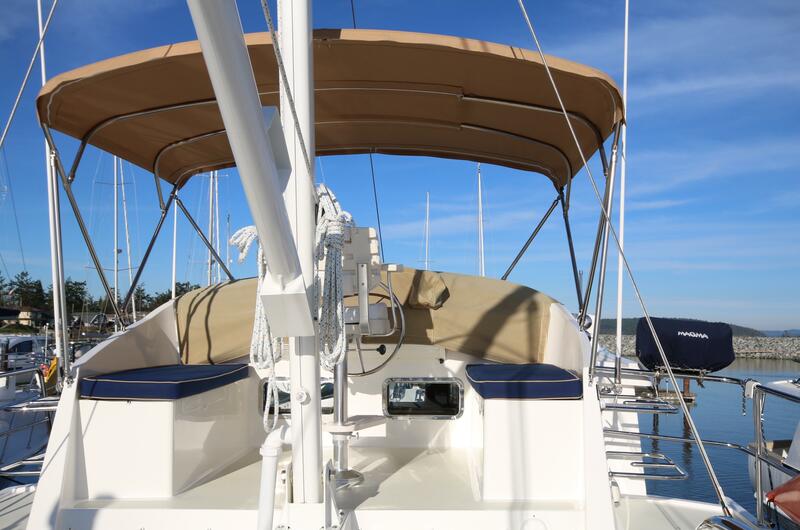 She has also proven herself to be the perfect single handers adventure cruiser as she is an absolute breeze to manage without crew. 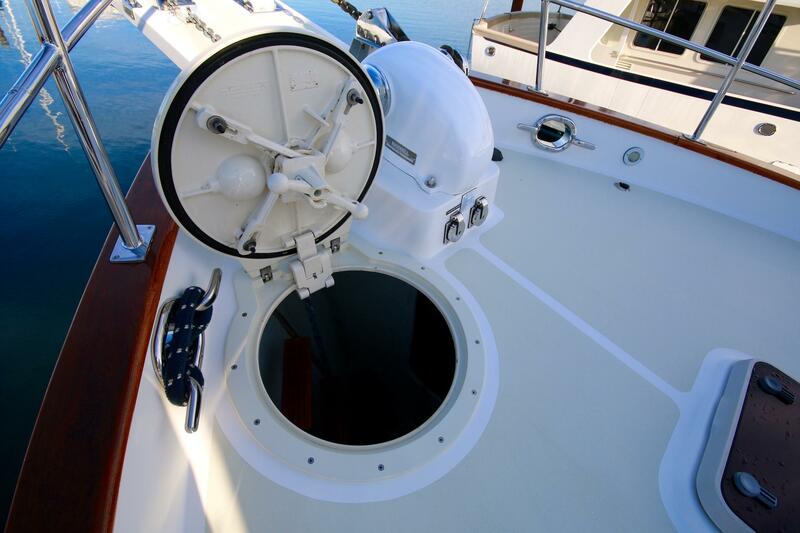 Bow and stern thrusters simplify docking. 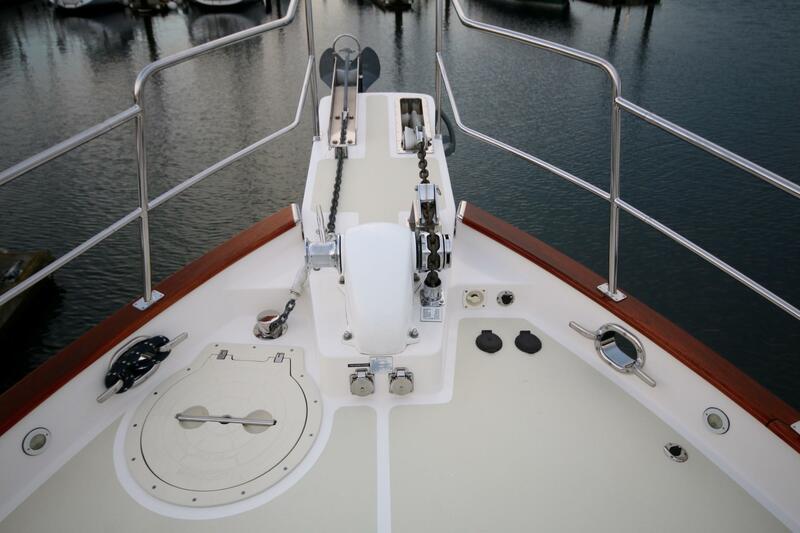 While maneuvering from the pilothouse the aft camera with tilt, pan and zoom features provides all the necessary visibility aft. 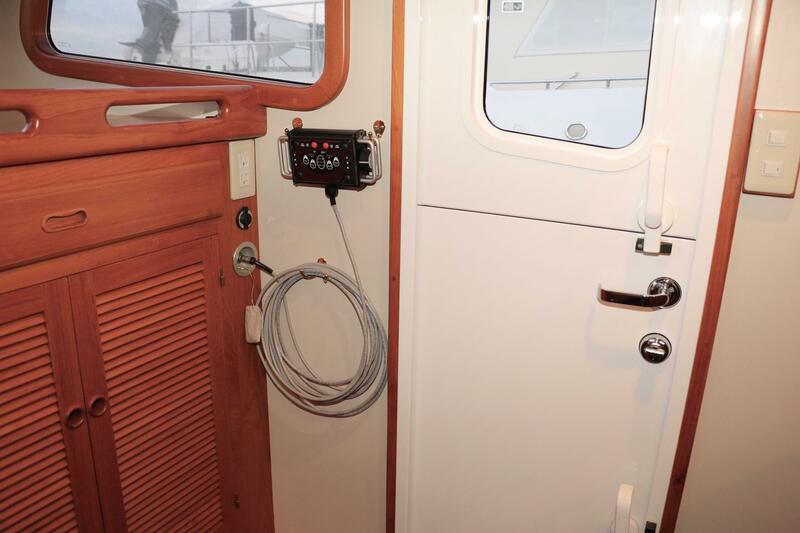 Beyond that, a full function wired remote control provides engine and thruster control from anywhere on the boat. 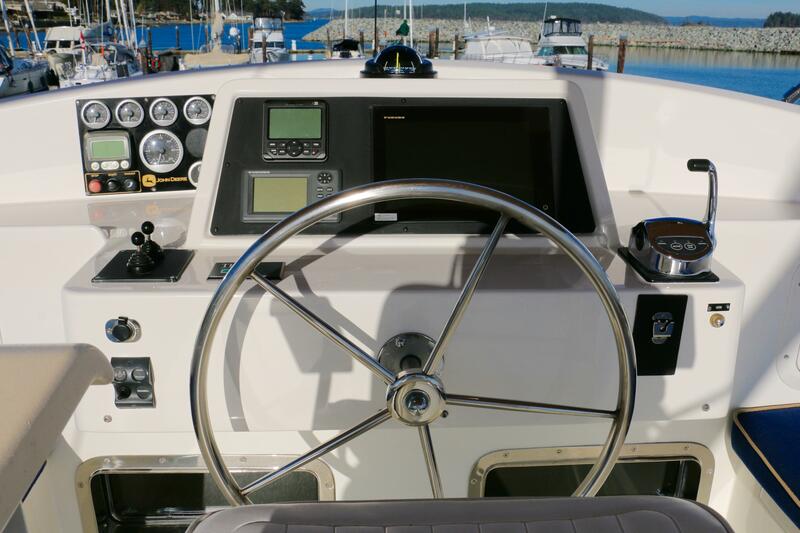 When you are buying a previously owned cruising boat, you normally have to allow for all the systems that will need to be updated after buying the boat. Not so on Harmony. 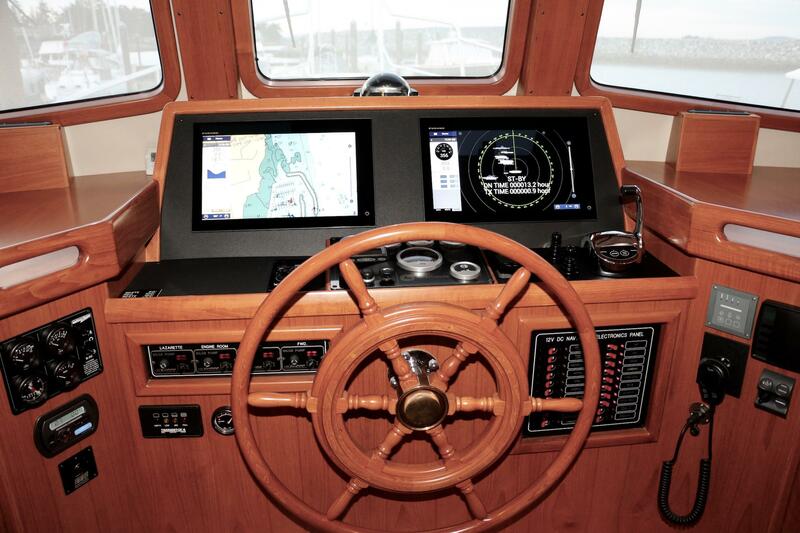 She has been recently equipped the the very latest in navigation systems, now boasting the latest Furuno TZT-2 15" MFD's with Furuno NXT digital Doppler radar, AIS, etc. 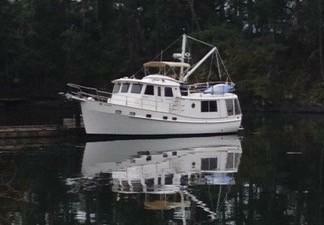 She has just been outfitted with all new Lifeline AGM batteries, new stainless steel refrigerator. Engine, Generator, Cooling systems, stabilizers, sanitation system have all received ongoing preventive maintenance. All exterior canvas has been recently replaced and / or updated. No matter what features and comforts she boasts; no matter how pristine her engine room and systems; no matter her equipment list; no matter her extensive, detailed maintenance records, there is one thing that simply cannot be matched by any other boat in this range: ...and that is the safety, security and unmatched ride of the Kadey Krogen 44 in a seaway. She is truly "at home on any sea". Hull, Superstructure and Decks all made from single piece female molds. All molds are vacuum-bagged. 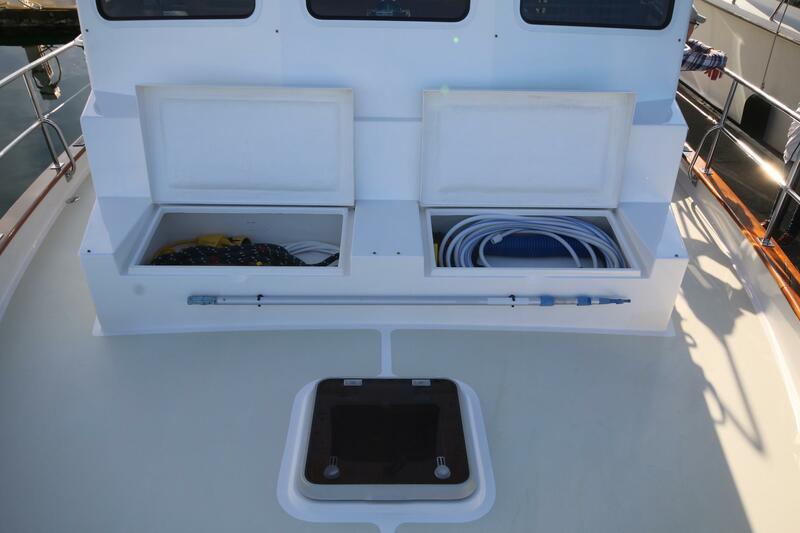 Hull construction includes use of USA-made Cook gelcoat. 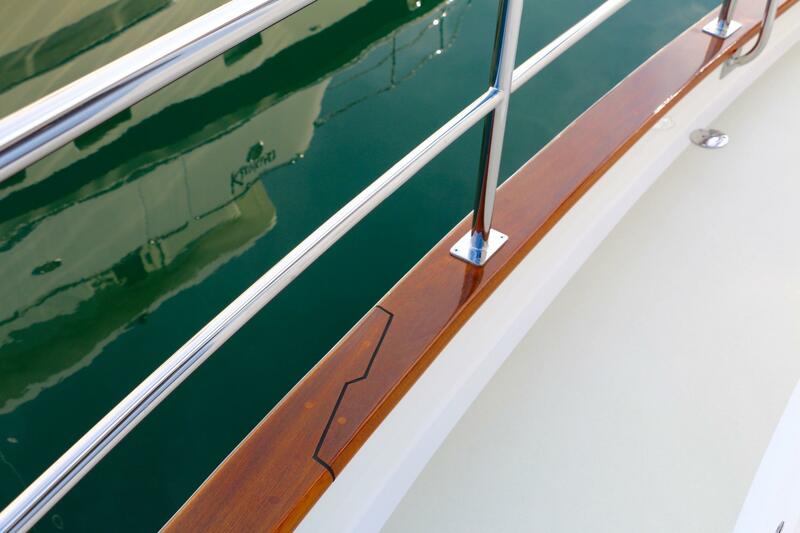 Hand-laid Knytex fibreglass with closed-cell PVC sandwich core used in topsides. 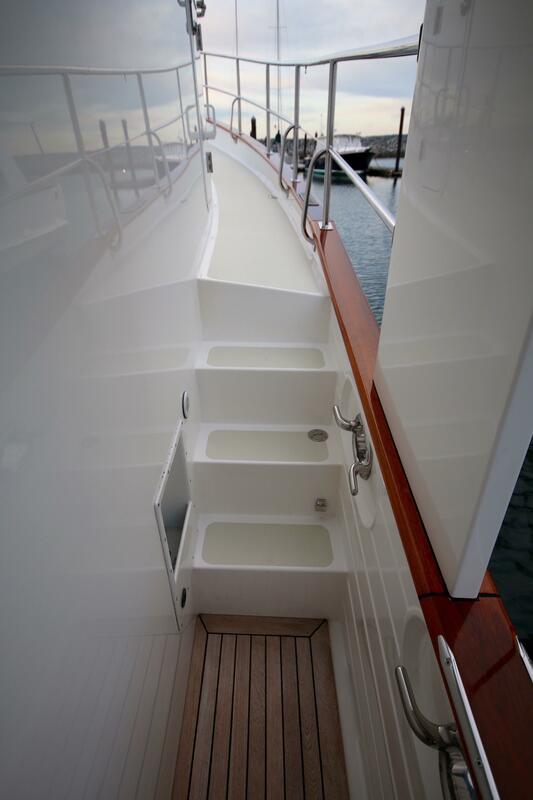 Solid fibreglass below the waterline with blister resistant vinylester resins. 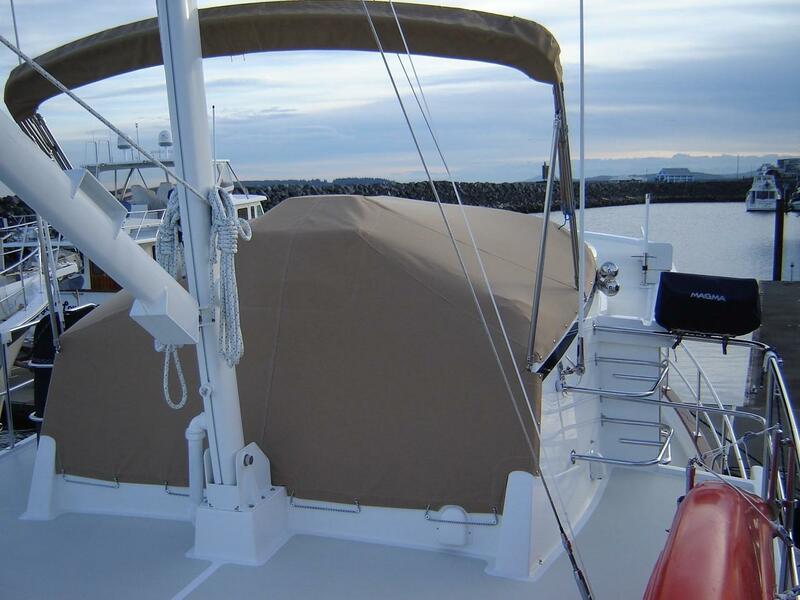 Aramid (different brand name than Kevlar) reinforced hull for impact protection. Watertight bulkheads and hatches including "crash" bulkheads fore and aft and a Freeman deck hatch forward. The cockpit is the typical entry point of the design. Heavy duty hinged boarding gates are built into port and starboard sides of the cockpit to ease entry from a dock. 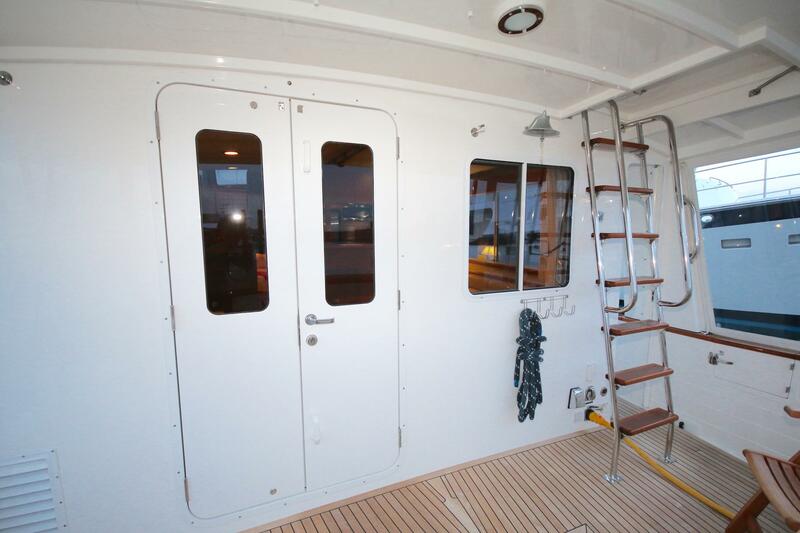 Full size aft hinged gate provides access to swim platform. 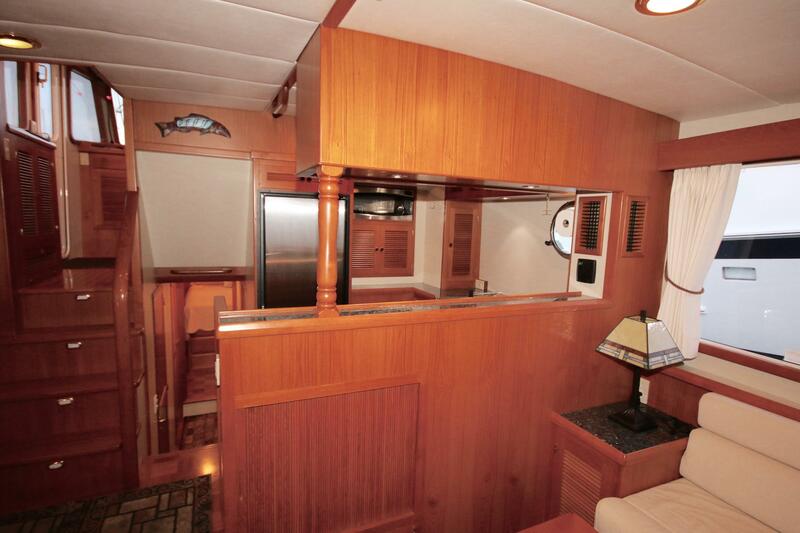 Teak cabinet forward on port side with beverage centre, upper bookcase, granite countertop, icemaker and storage. 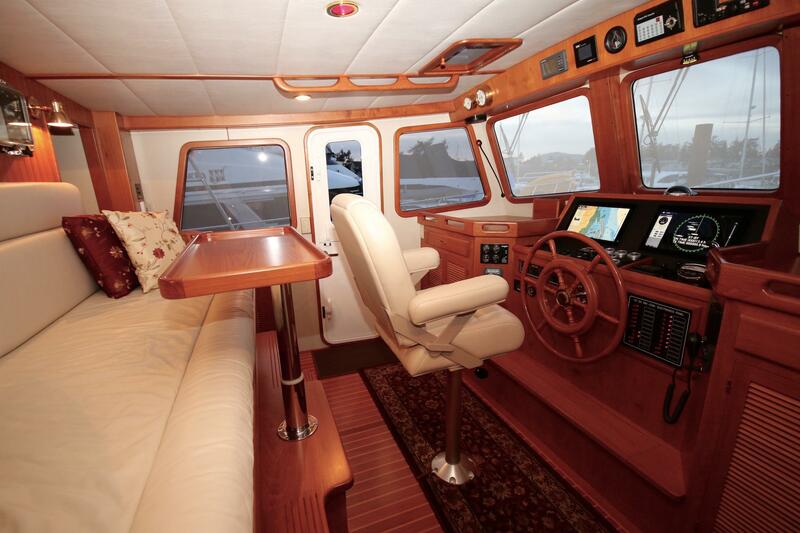 Up 4 easy steps from the Salon / Galley one reaches the pilothouse. 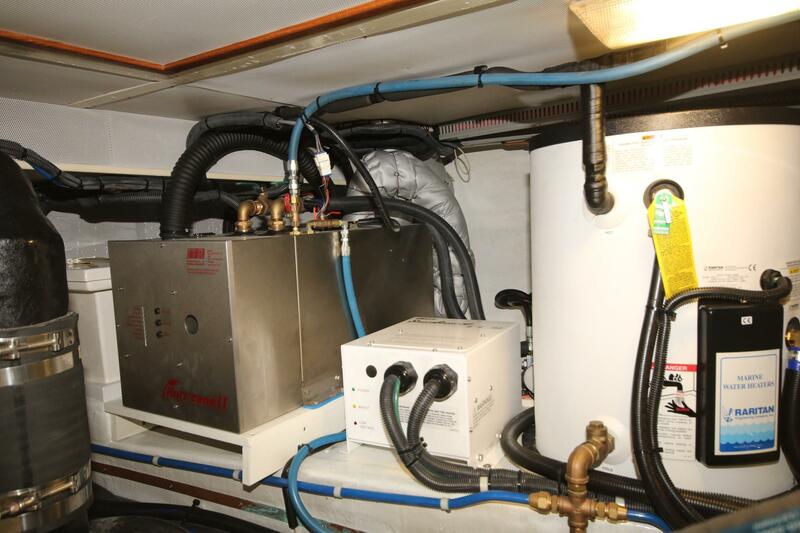 Hydronic furnace heats hot water w/ engine heat exch. All accessories including lifting bridle, pump, oars, etc. 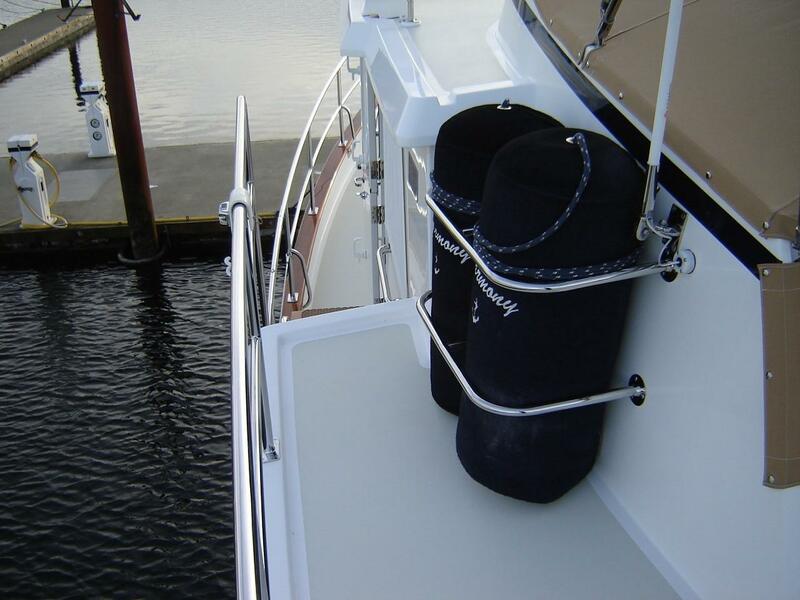 6 each HD 1" dock lines, 6 fenders with covers, etc. Engine spare parts kit incl. filters, pumps, belts, etc. Generator spare parts kit incl. filters, pumps, etc. All required safety equipment incl. up to date flares, certified fire extinguishers, life jackets, life ring, etc. Call us at Vancouver: 604-687-8943 or Sidney: 250-656-8909. Don't feel like talking? You can contact us using the form below. Hi there, I would like more information about the Kadey-Krogen 44. Disclaimer: The Company offers the details of this vessel in good faith but cannot guarantee or warrant the accuracy of this information nor warrant the condition of the vessel. A buyer should instruct his agents, or his surveyors, to investigatge such details as the buyer desires validated. Price, if shown, may not include applicable state or government fees, taxes, destination charges, preparation charges, or finance charges (if applicable). Final actual sales price may vary depending on options or accessories selected. 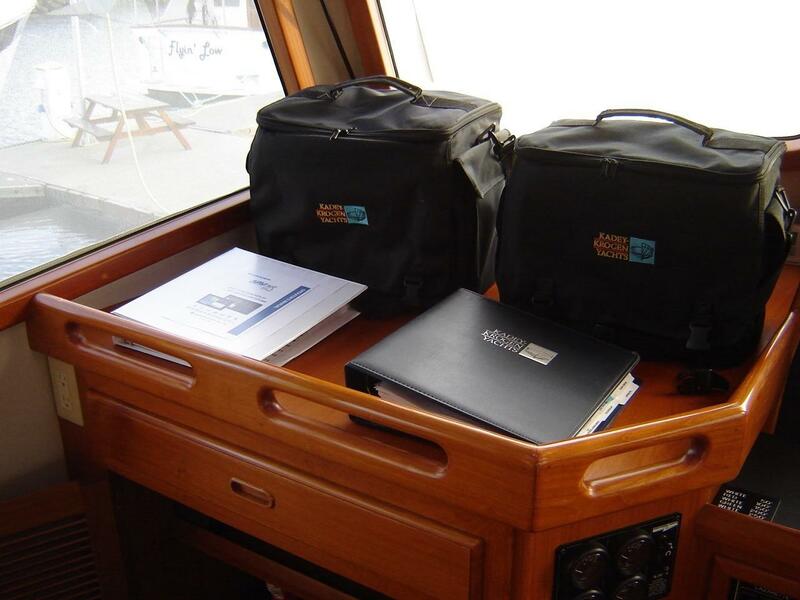 This vessel is offered subject to prior sale, price change, manufacturer revision, or withdrawal without notice.